When a child is born in a hospital or a medical institution, the informant is the head of the hospital or, failing that, the physician or any person who attended the mother within 30 days of the delivery. In case of non-declaration by the hospital or a medical institution within the time limit of 30 days, the child’s parents have an additional 60 days to make the declaration (article 31). Penalty for late registration Yes, the cost is increased in the case of a late declaration of the birth, or the parents are obliged to go through the Tribunal for a supplementary judgment. Births declared after the deadline may be registered at the request of the public prosecutor within 6 months of birth (Act No. 2011/011, article 32). When a birth has not been declared within the 6-month period, it cannot be registered by the civil registrar, but only by virtue of a declaratory judgment rendered by the competent court authority (Act No. 2011/011, article 33). -Date on which the birth certificate is drawn up (article 34). 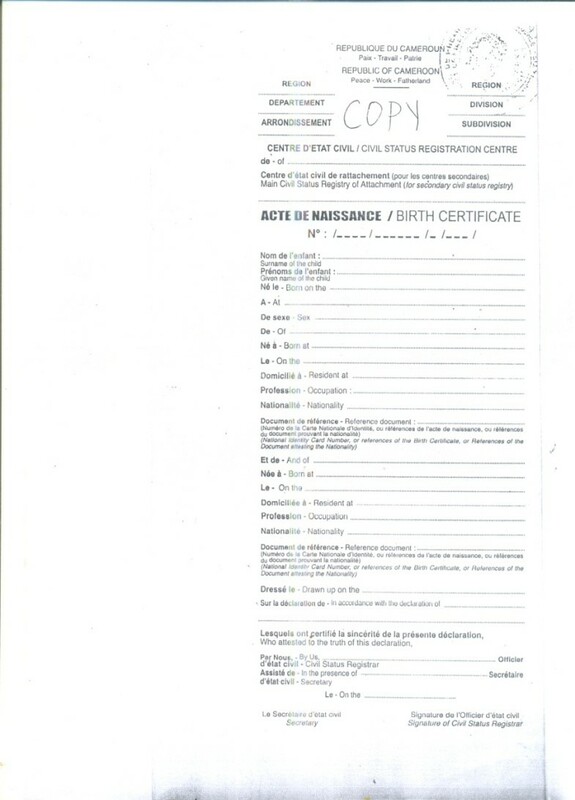 All vital events are directly recorded on standardized forms, their fill fields are free and they are manually filled in cursive writing, which prohibits their subsequent exploitation by optical character recognition. Process for establishing vital statistics on births There is no mechanism to transfer the information collected in the registers to the National Institute of Statistics. Exemption: Marriage cannot be celebrated if the bride is under 15 years old or the groom is under 18 years old, unless dispensed by the President of the Republic on serious grounds (article 52). One month before the celebration of the marriage, the civil registration officer shall have before him or her a declaration stating the names, surnames, profession, domicile, age and place of birth of the future spouses (article 53). 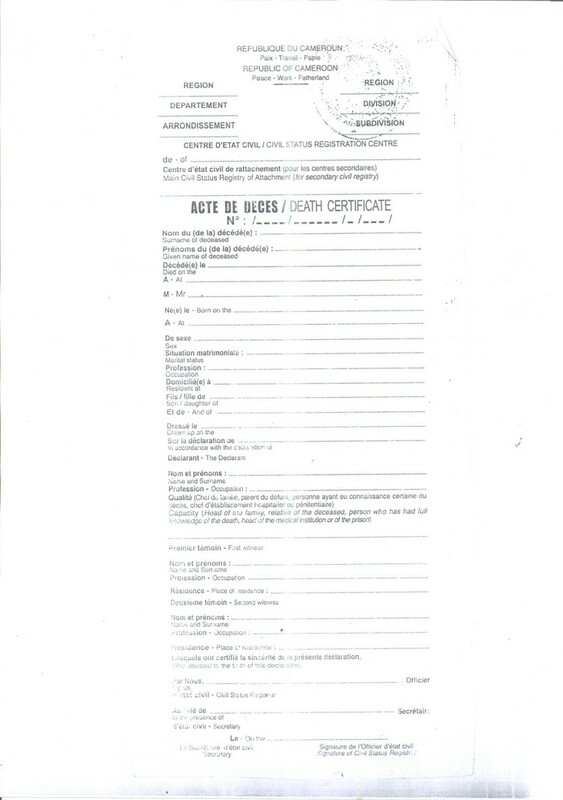 The civil registration officer immediately proceeds to the publication of the declaration by posting it to the civil registration centre (article 54). The celebration of marriage must take place in the presence of: the future spouses and the representative of the prospective spouse; legal or customary parents or guardians where consent is required; at least two witnesses at least one per spouse (article 69). 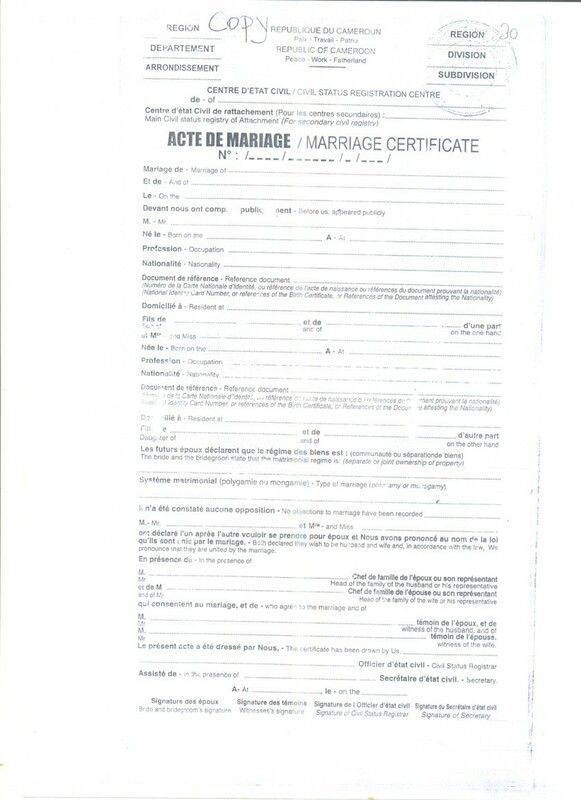 The marriage certificate shall be jointly signed by the spouses, witnesses, officer and secretary of civil status. An original is given to each spouse (Act No. 2011/011, article 49). – Signatures of the spouses, witnesses, officer and registrar. (Act No. 2011/011, article 49). Processing Manually (on paper); All vital events are directly recorded on non-standardized forms, their fill fields are free and they are manually filled in cursive writing, which prohibits their subsequent exploitation by optical character recognition. Place of registration Main or secondary civil registration centres. Process for establishing vital statistics on marriage There is no mechanism to transfer of the information collected in the register to the National Institute of Statistics. Penalty for late registration In the event of a late declaration of death, the declarant is obliged to go through the Tribunal for a declaratory judgment, which includes costs. Requirements for death registration The death declaration must be certified by two witnesses. Process for establishing vital statistics on deaths There is no mechanism to transfer the information collected in the register to the National Institute of Statistics.